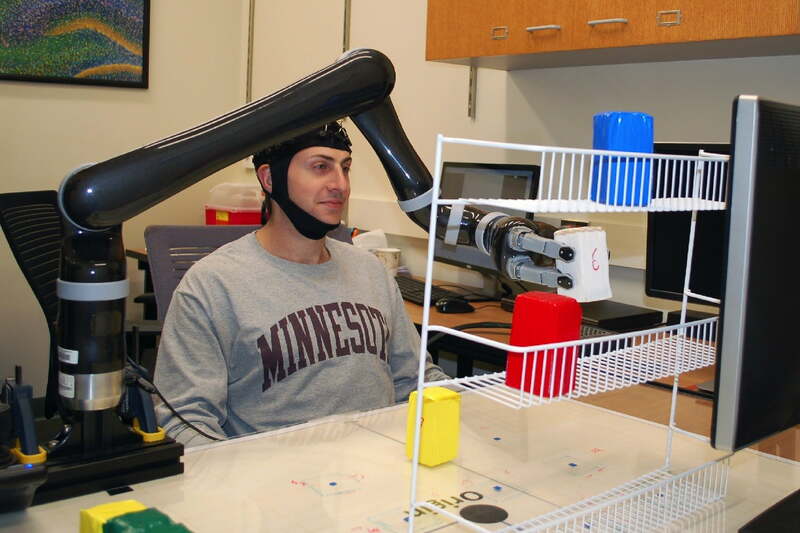 Researchers at the University of Minnesota claim to have made a significant breakthrough in the field of neural interfaces by creating a system which allows people to control a robotic arm using just their thoughts. Published in the journal Scientific Reports, the research is particularly impressive because it allows a robot arm to be made to manipulate objects in a complex 3D environment without the use of a brain implant. Instead of a brain implant, the technology involves an electroencephalography (EEG) setup, which records electrical activity from the brain using a cap kitted out with 64 electrodes. Signal processing and AI machine learning technology then decodes these thoughts and turns them into specific actions for the robot to perform. In the study, subjects started by learning to control a cursor on a computer screen. They then moved into the physical world by getting the robot arm to pick up objects on a table and place them on a three-layer shelf. All of the participants were able to control the arm, and success rates for precisely moving the objects ranged from 70-80 percent. “We plan to move forward to test [the] prosthetic arm down the road to directly test the applicability of noninvasive BCI technology to help patients,” Professor He continued. While at present this remains a fascinating futuristic research project, it is easy to see how this kind of technology might dramatically improve the lives of people with disabilities — in addition to having other applications involving the remote control of robots.